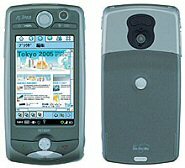 NTT DoCoMo has partnered with Motorola to roll-out a hybrid FOMA/PDA handset with global roaming, full Internet browsing, PC mail and wireless LAN access. Launched today at a low key Tokyo press conference, the new M1000 [.jpg image] is aimed squarely at Japanese business users looking to integrate a lot of functionality into one pocket-sized package. DoCoMo has dumped both i-mode and its new FeliCa applications to make room for a tri-band system (W-CDMA, GSM and GPRS) and Internet access via Opera’s 7.5 browser. The company’s trophy handset opens Microsoft Word, Excel and PowerPoint programs as well as PDF files, and allows multiple email functions including POP and IMAP email. It’s also compatible with 80211.b WiFi (Wow!). While equipped with pre-requisite Bluetooth compatibility, this new Motorola is not loaded with DoCoMo’s flagship product, i-mode access — a first for a major handset since 1999, as far as we can determine. Will this be a cool crossbreed or Frankenstein monster? The 2.9-inch screen is bright and clear — in fact, it’s so big and so bright that it takes up the entire phone, leaving no room for a keypad. Replaced by a PDA-style touch panel, users will need good eyes and a steady hand for both dialing and on-screen navigation. The unit falls short of integrating a hard drive into what is otherwise a pretty novel package. It has only 19 MB of internal memory augmented by an external 32 MBs of flash memory plus an SD memory card adapter. Arguably this is a lot for a cell phone but the M1000 is being positioned as a serious business tool and hard-drive-equipped cell phones measure their worth in gigabytes. At least users finally have a DoCoMo handset compatible with all major overseas networks (But not i-mode — Ed.). Probably the biggest surprise of the afternoon was that the ‘M’ in M1000 stands for Motorola, not Mitsubishi. The two companies haven’t worked together since 1998′s release of the M206 and the US manufacturer is not exactly the first name that springs to mind when thinking of cool, cutting-edge Japanese phone design. Panasonic, yes. Sharp, sure. Sony Ericsson, definitely. But Motorola: nope. Nonetheless, this celly seems to have exactly what DoCoMo is looking for. 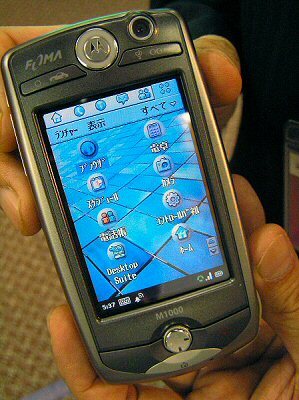 The M1000 is more PDA than phone and as Hirobumi Nakayama, assistant manager for the DoCoMo product department told WWJ at the press conference, “Motorola has a lot of experience in PDAs. We felt their background in the industry would be invaluable in speeding development of the M1000 to market.” Not to mention some economically advantageous development deals undoubtedly; Motorola must have been panting to polish up its dowdy image here. Japan’s leading telecom is synchronizing the M1000 launch with the introduction of Mopera U, a mobile ISP service for FOMA subscribers who connect to the Web via a PC, PDA or the M1000 handset. DoCoMo aims to start the service this June and right now plans are that WiFi connections for the M1000 will run through the Mopera system, billed on a flat rate (“Mopera” stands for something like ‘mobile personal radio access’ and is an older, 2G data service offering something like 19 Kbps – Ed.). Note that fixed-line Internet access for home computers via NTT East and West’s FLET’S ADSL or B FLET’S ISP services can also be added to Mopera U service contracts. Though DoCoMo would not give a definite date, the M1000 should be available in stores from late May. This is an important play for DoCoMo. The company wants very much to become a heavyweight international telecom player. Trapped in its proprietary networks, early attempts to buy its way into the overseas game added up to a lot of dead air. The company has been trying to learn from past mistakes and is starting to see some success through licensing i-mode to carriers in Europe. With the exception of a few industries, Japanese corporations have been reluctant to fast-track cell phones into their business plans. DoCoMo seem to believe the diverse elements of this cool crossbreed might tip the scales. At the same time, the company appeared just a little nervous that the M1000 might instead turn out to be a shiny Frankenstein monster that savages its creator. The launch today was so low key as to be practically non-descript. No flashing lights and blaring music, no gorgeous campaign girls or pop stars (all routine elements of big DoCoMo launches). Instead, there was a small brown conference room, plastic school chair/desk sets and one man at the podium talking really, really fast over a PowerPoint presentation. Which is a shame; this is a daring step for DoCoMo and at least, dumping i-mode could not have been an easy decision to take. For all the stats (except made by Motorola?) see the English press release here.